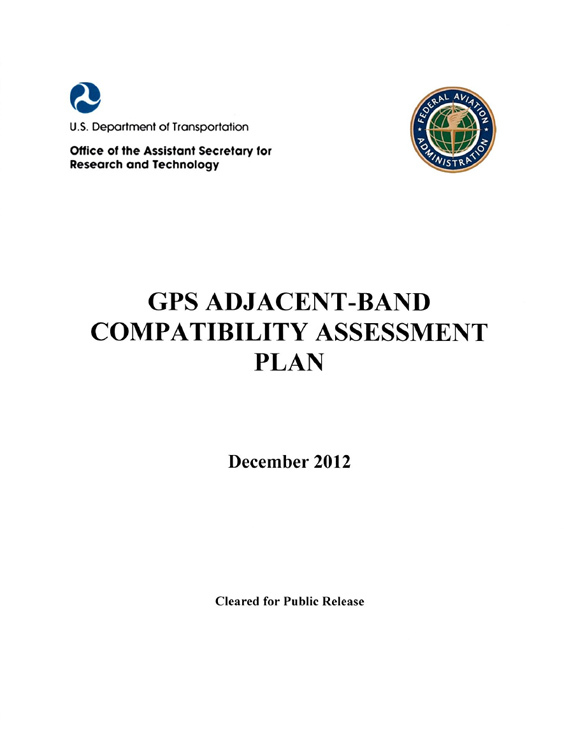 A Federal Register notice published on July 7, 2016 announced Department of Transportation (DoT) plans to conduct additional testing of GPS/GNSS receivers this month as part of their Adjacent Band Compatibility (ABC) Study. The notice was issued by DoT Assistant Secretary for Research and Technology Gregory Winfree. The additional lab testing will be conducted at Zeta Associates in Fairfax, Virginia, and MITRE Corporation in Bedford, Massachusetts. It takes place in the context of a renewed push by Ligado (formerly Lightsquared Inc.) to obtain Federal Communications Commission approval to establish a terrestrial wireless broadband network in the United States in radio frequency spectrum near the band occupied by GPS L1 signals and those the other GNSS systems. The goal of the ABC Study, overseen through the DoT’s Office of the Assistant Secretary for Research and Technology (OST-R), is to evaluate the adjacent radio frequency band power levels that can be tolerated by GPS/GNSS receivers. It is also designed to advance DoT’s understanding of the extent to which such power levels impact devices used for transportation safety purposes, among other GPS/GNSS applications. In April 2016, radiated testing of GNSS devices took place in an anechoic chamber at the U.S. Army Research Laboratory at the White Sands Missile Range (WSMR) facility in New Mexico. The ABC Study provides for testing various categories of receivers, include aviation (non-certified), cellular, general location/navigation, high precision and networks, timing, and space-based receivers. The notice indicated that approximately 12 receivers, representing each of these receiver categories, will be selected for additional testing from among those receivers tested in April. Over the past year DoT obtained comments from public outreach that included four public meetings with stakeholders on September 18 and December 4, 2014, and March 12 and October 2, 2015. OST-R issued a draft test plan on September 9, 2015, and received comments on it, which led to publication of a final test plan on March 9, 2016, and requested voluntary participation in this Study by any interested GPS/GNSS device manufacturers or other parties whose products incorporate GPS/GNSS devices. The acquisition test will be conducted using 10 megahertz LTE signals at four frequencies: base station frequencies of 1525 MHz and 1550 MHz; hand-set frequencies of 1620 MHz and 1645 MHz. The Federal Register notice can be found here. Information referenced in the notice and further background can be found online at on the National Coordination Office for Space-Based Positioning, Navigation, and Timing website. For ruther information, contact Stephen Mackey at the DOT/OST-R Volpe National Transportation Systems Center: email <stephen.mackey@dot.gov> or telephone 617-494-2753.